Obama is complicit in the planned destruction of the US. It’s obvious. The writings of Sir. Francis Bacon in the New Atlantis makes it evident that the USA is a sacrificial lamb (a dying Phoenix Bird) that is to be “burnt to the ground” (See Revelation 18) so that out of it’s ashes rises the New World Order (Rev 13). 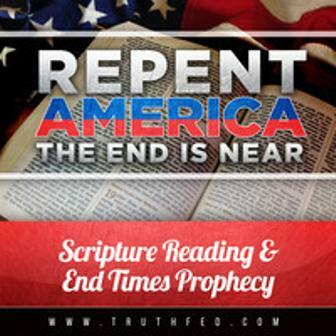 America was designated as the New Atlantis that would lead the world to the Antichrist. The original national bird envisioned by our Masonic leadership in the late 1700s was not the American Eagle, but the Phoenix Bird. This historic fact strongly suggests that, at the right moment in world history, with the world entering through the portals of the Kingdom of Antichrist, America might suddenly be immolated in fiery flames, burning to the ashes; out of these ashes, the New World Order would arise. In 1978 my mother told me the Lord gave her a vision of the Antichrist. She was told that he was a mulatto man about my age; which is unreal considering it was 1978 and I am almost 53). The odds of her saying that in 1978 is about some subordinate Antichrist “like” figure has got to be 1 in a million. 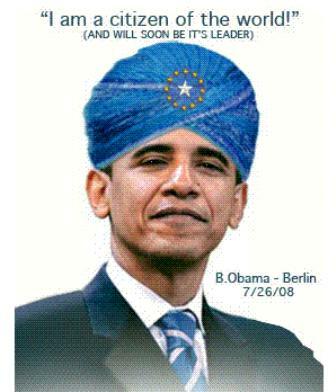 And soon thereafter I was informed that David Ebaugh, a well known Bible teacher in the Harrisburg, Pennsylvania was given a vision of the Antichrist and he was wearing a BLUE TURBAN (note the photo above; it is out on the Internet and I had nothing to do with its creation). I know the Bible says there are more than one Antichrist AND I know very well that the “fallen angelic beings” will come to the earth parading as “Ascended Masters” with Sananda their “fake Jesus” and heal the sick and do all sorts of “power, signs and lying wonders” ref. 2 Thess 2. and (see the V for Visitors). But I know Obama is a Muslim and I know he kissed the Saudi King’s Ring; and I know they are NOT going to rebuild the Third Solomon’s Temple …. 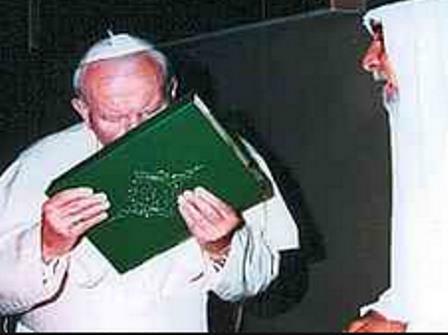 I also KNOW that the papacy is in bed with the Muslim world. If you have eyes to see, the scripture makes this clear. God bless you. See this scripture. Pray about it. “An evil and adulterous generation seeks after a sign [ the Third Solomon’s Temple], and no sign will be given to it except the sign of the prophet Jonah. 40 For as Jonah was three days and three nights in the belly of the great fish [Three Days of Darkness, Rev 6:12 sun turns black], so will the Son of Man be three days and three nights in the heart of the earth. 41 The men of Nineveh [A Type for the USA burned by fire see Nahum] will rise up in the judgment with this generation and condemn it [The Muslim nations condemn the US for its “westernization” which is actually an abomination to God] , because they repented at the preaching of Jonah; and indeed a greater than Jonah is here. 42 The queen of the South[Saudi Arabia, etc.] will rise up in the judgment with this generation and condemn it, for she came from the ends of the earth to hear the wisdom of Solomon[Solomon and the Queen of Sheba]; and indeed a greater than Solomon is here. I love days like today. As one might guess we (“Tribulation Now”) is going FULL THROTTLE over this praise Jesus! 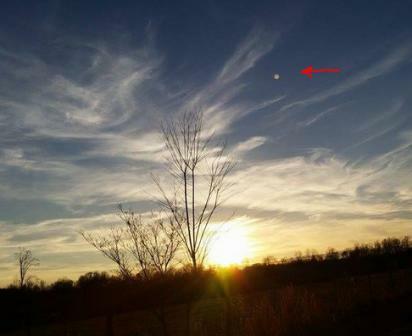 This appears to be Nibiru with its 5 (5-7) moons in perfect view of the camera. Download the videos to your local computer fast because these will probably get taken down soon enough. After these images came out we contacted a number of people regarding them and not surprisingly were met with mixed responses from extremely excited to somewhat skeptical (unfortunately). Some people appear to be in denial. This is actually a dynamic that is prophesied in the Bible. Praise God. 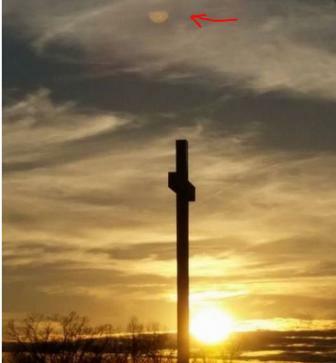 We should be excited about this bizarre sighting because Jesus warned us that we WOULD see signs in the sun, moon and stars. Well – there you have it. It doesn’t get any better than this. Praise God. Admittedly the notions that this is some type of “lens flare” completely befuddle me because it doesn’t take a skilled person to clearly see (in the photos below) that this CAN NOT be a lens flare. 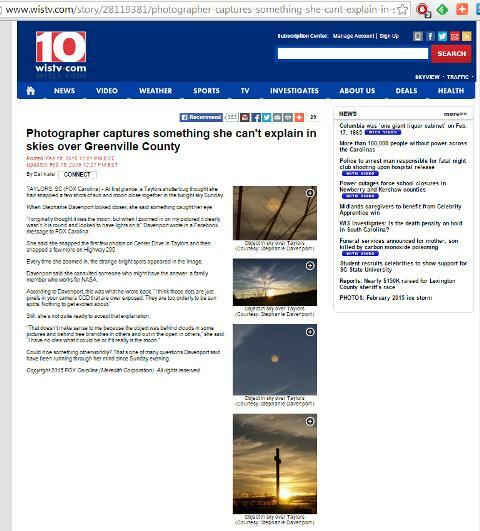 Not only were the original images taken by a person with photography experience, but she was certain that clouds and other objects such a tree limbs were seen IN FRONT of it clearly. 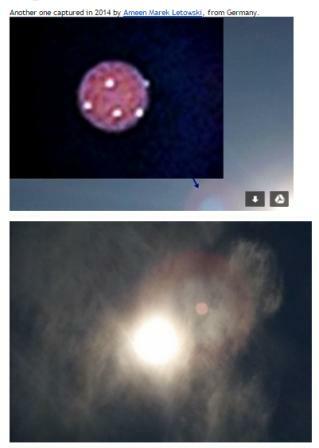 Moreover the pink hued image below, (from 2014 – showing the same object) clearly shows a 3 dimensional element of the moon / orbitals. How anyone can miss that is … well … beyond me. Still, she’s not quite ready to accept that explanation. Could it be something otherworldly? That’s one of many questions Davenport said have been running through her mind since Sunday evening. 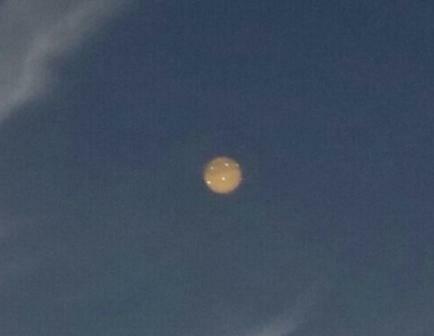 Could it be something “OTHER WORLDLY”? Today on TRUTHFED I had the pleasure to chat with Johnny Baptist about the gifts of the Holy Spirit, Mystery Babylon the Great, The Marriage Supper of the Lamb, the wise and foolish virgins and much, much more. Disclaimer: WARNING – This podcast may prove damaging to the comfort of closely held presuppositions.